Drainage culverts installed in permafrost zones are susceptible to potential high settlement ranges and “pull-apart” forces. Both the Government of Yukon Department of Highways and Public Works (HPW) and the Alaska Department of Transportation have found that Welded Lockseam Corrugated Steel Pipe (CSP) in 3.5 mm wall thickness has the required strength and performance to be an effective solution for drainage culverts up to 1,200 mm in diameter. AIL manufactured and supplied 268 lineal metres of Welded Lockseam CSP for use along the Yukon’s Alaska Highway. Following fabrication in our Armstrong, BC plant, the pipe was sent through a second process, applying a continuous weld to the pipe’s exterior lockseam — end to end on each section. To achieve a high degree of quality, we invested in an automated process with a welding procedure that was documented and reviewed by the Government of Yukon HPW prior to the manufacturing run. The Government of Yukon HPW trench design was lined with a heavy woven geotextile and 100-mm-thick rigid polystyrene boards. In addition, the backfill envelope around the pipe was reinforced with six layers of biaxial geogrid. The Welded Lockseam Corrugated Steel Pipe was used at various locations between kms 1,818 and 1,868 along the Alaska Highway. Following on-time delivery of the pipe and couplers, AIL team members visited one of the sites to meet with the contractor’s on-site team and a Government of Yukon HPW representative to ensure everything was in order and to offer any technical assistance. George Freeman Trail is a major range road forming the Eastern perimeter of Strathmore, Alberta, just east of Calgary. An aging wooden bridge structure was in dire need of replacement, but the work had to happen in a tight, late fall timeframe. 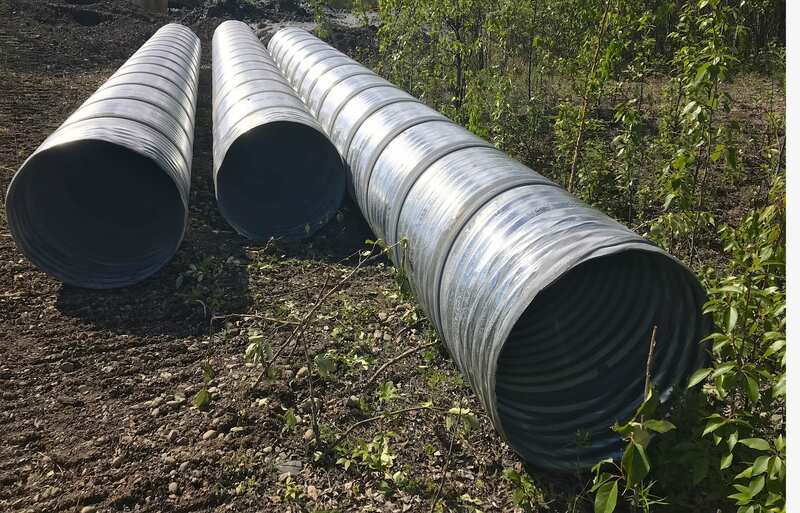 AIL recently supplied a large order of Corrugated Steel Pipe (CSP) to be used in construction of exploration and haul roads for a mine near Rankin Inlet in Nunavut.